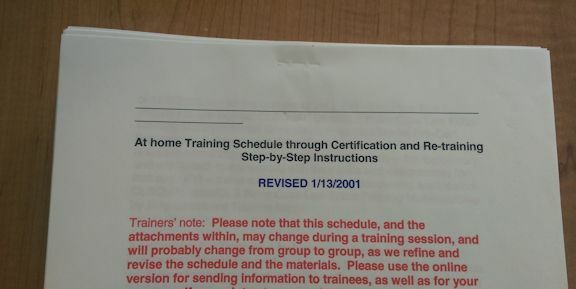 While looking through some work-related papers at the back of a desk drawer in my home study, I found a stack of training materials from January 2001, when I helped to train a group of new hires. 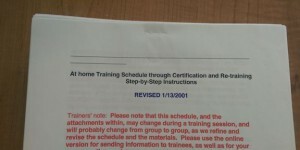 There was some other useless stuff in there too, like instructions for installing Windows 2000, along with a stack of paper newsletters (what a quaint concept that seems now!) from that time period. Evidently, I had put all that stuff in the drawer and left it there for many years without looking at it. I would say there’s another training lesson to take away from this discovery—the need to train oneself in the habit of regularly disposing of clutter, otherwise it builds up without even being noticed. Drawers, shelves, closets… they’re all magnets for clutter, and they can’t be kept organized without taking an inventory of the contents every once in a while. Especially in the modern world, with so many things becoming obsolete in just a few years, it’s all too easy to end up with a heap of useless stuff that has long outlived its purpose.